Moroso's Accumulator connects to the pressure side of an engine's oiling system. When the engine is running, oil pressure forces reserve oil into the accumulator & compresses the air ahead. If oil pressure should suddenly drop due to hard acceleration/braking or severe cornering, air pressure immediately sends oil to the main galleries. When danger passes & the pump is once again primed with oil, oil pressure forces oil back into the Accumulator to prepare for the next emergency. 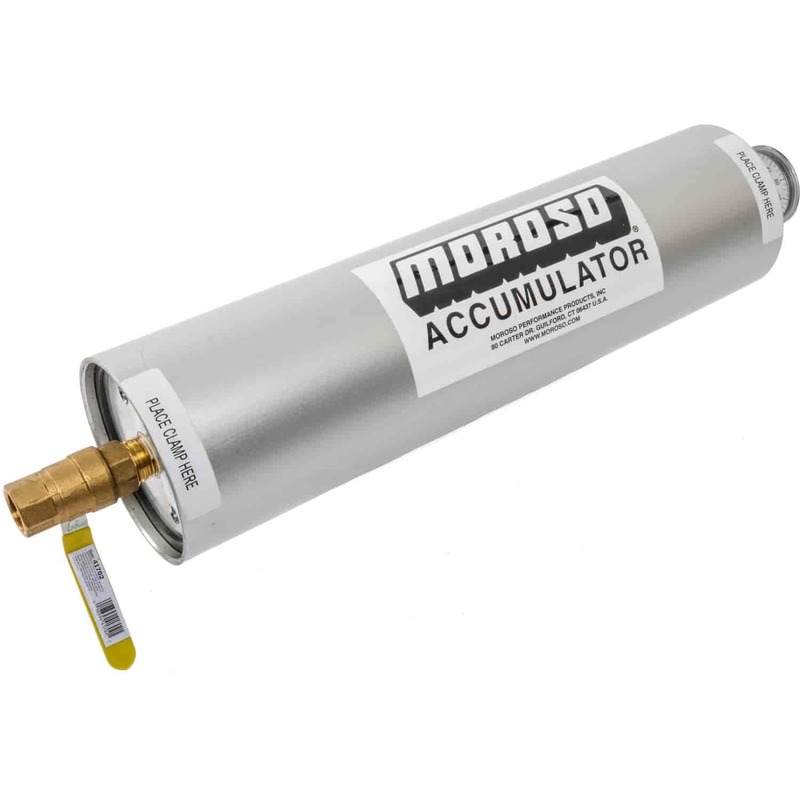 Moroso Accumulators can also manually pre-lube engines before start-up to prevent cold-start scuffing and premature bearing wear. 23900 - Moroso Oil Accumulators & Accessories is rated 5.0 out of 5 by 2. Rated 5 out of 5 by Snow White from Does the job! Use on my rock bouncer to keep a more constant oil pressure when on extreme angles! Gives me peace of mind knowing I don't have to keep an eye on oil pressure! Rated 5 out of 5 by Mister Mike from SAVING YOUR ENGINE! This Moroso oil accumulator purchase is my third from Jegs. I have a V-10 Dodge that sits for long periods between use and at 95,000 I freshened the engine (long story) and all the rod bearings were in the copper layer so I added the protection of the accumulator. I also own a 1966 Plymouth with a 493 stroker motor that sits all winter every year (Michigan) and it makes me happy to watch the oil pressure rise before I crank it over every time. This latest accumulator is for my 1965 Plymouth in which I am installing a $24,000 engine. Cheap insurance in my book!